All spring long, they were pushed around by the influx of immigrant laborers. All summer, they idled their time, watching the immigrants attempt to assimilate, learning our actions, our mannerisms. All fall, they've have to listen to the press rave about how the immigrants are better than the indigenous work force. But on September 24, on the season premiere of NBC's "Heroes," the American actors finally struck back! Follow through after the bump for more hyperbolic rambling about the "Heroes" premiere. Sorry, but I'm just loving that fact that after a development season in which NBC's casting department said "Go British!" for every possible American lead role (regardless of whether or not the otherwise excellent Kevin McKidd is even vaguely capable of speaking with a Yankee accent [he isn't]), "Heroes" finally unveiled the 17th Century Japanese warrior Kensei and not only did he turn out to be a gaijin, but he turned out to be a Brit. But rather than actually casting a British actor? Nice! They go with Oregon-born David Anders, working a different Limey accent from the one he used for years on "Alias." I like Anders, because he starred in my friend Mike Arquilla's musical, but in a world where he's British and McKidd is from San Francisco, this writer is just very confused. 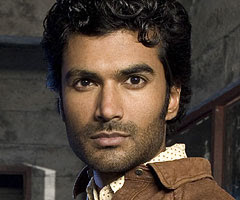 "Heroes" already has Chicago-born Sendhil Ramamurthy playing Indian academic Mohinder Suresh and Sepinwall notes that the hammy Irishman -- who went looking in a crate for his Lucky Charms and instead found the unclothed (but newly buff?) Peter Patrelli covering in the corner -- was played by New York-born Holt McCallany, who in real life doesn't talk like he's auditioning for an Irish Spring commercial. I still imagine Anders, Ramamurthy and McCallany (and Masi Oka as well, I guess, though there hasn't been a run of Japanese actors rushing to steal parts on American series) standing up, Bill Pullman-style, and declaring, "And should we win the day, the 24th of September will no longer be known as an American holiday, but as the day the American actors declared in one voice: 'We will not go quietly into the night!' We will not vanish without a fight! We're going to live on! We're going to survive! Today we celebrate our Independence Day!" OK. I'm done with that. Really, the "Heroes" premiere was just an episode of "Heroes," which came as a pretty big relief after a finale that everybody but the show's creators knows was disastrous. Monday's episode laid the groundwork for the season, introduced oodles of new characters and never once caused me to yell at my TV, "Stop being so stupid, 'Heroes'!" My favorite part of the episode may have been something we didn't see, namely Matt and Mohinder raising little Molly as a well-adjusted gay couple. I would love to have been a fly on the wall (or able to read minds) at *that* custody hearing. I imagine that it was like "Chuck and Larry" only without the positives of Jessica Biel in her undies, but also the negatives of Rob Schneider as an ethnic caricature. Or else my favorite thing in the episode may have been Adrian Pasdar's beard. As faithful Zap2it blog readers know, I had a brief and awkward discussion with Pasdar at this year's TCA press tour. The long and short of the conversation was that as an owner of a newly acquired beard, I wanted to know if his own lustrous facial hair was conditioned in some way. The long and short of his answer (as he apparently spat chaw in a cup) was that his glow was all natural. The truth, it turns out, is that his beard was conditioned by beer and tears of grief at the death of his brother. Of course, Peter isn't actually dead. He's just become Angel from the start of Season 3 of "Buffy the Vampire Slayer," all half-feral, forgetful and naked. That plotline doesn't interest me so much, sorry. There are, of course, myriad other things to discuss. Who threw Sulu off the rooftop? Who knew that Ned Ryerson was an alchemist? What is it that A.J. Soprano's ex-near-fiance is able to do? Why was Claire's chemistry teacher lecturing on Darwin (and why did nobody else know the answer)? And can we please have more Barry Shabaka Henley in upcoming episodes? The Heroes premiere was never more than mildly interesting. That chemistry scene was patently ridiculous. Also ridiculous is Claire's douchebaggy love interest who speaks of "robots" and "aliens." Shut up, teenage boy who thinks he's deep and interesting. You are neither. I am happy David Anders is using a British accent because every time I hear his normal voice it just sounds WRONG. I prefer the Sark dialect, but beggars can't be choosers I suppose. West: "Why were you putting your hand on the flame?" Claire: "Oh, I just wanted to see if it's hot." West: "Uh, duh. Of course it's hot, that's why they call it a flame." That makes absolutely no sense. "That's why they call it" needs to be followed by a self-explanatory term that contains an obvious meaning. I think it was just another proof that Tim Kring is incapable of writing humans, as any normal person would of cut out the "that's why they call it" part. Because it's entirely superfluous and downright inane. Alexis Denisof should be forced to speak Brit at all times. Do you think Alyson Hannigan makes him talk that way at home? I do.